I’m not sure whether any domain investors have visited SeWatch.net. If you’re looking for a buyer, I believe this website will help you. After you search Google for potential buyers, input the website into the search window on SeWatch.net will generate SEO information such as site tags, which are keywords a website uses to compete for traffic in different categories. Furthermore, if you own any domain names that are an exact match to the website’s tags, you can use that information as a selling tool. High traffic websites may reply back to ask a price. Even low traffic sites that want to establish a web presence may take a chance on acquiring your domain name. The keyword to selling a domain name is finding the right buyer. There is always a buyer for a good name. A good name is a domain with market value. It will have exact match keywords without the extra baggage. Adjectives such as the following are good to attract attention to a product, but I believe that service domains must have an exact match to increase your chances at making a sale. The adjective above are effective in the product and job niche, but can weigh down other domain names. However, there are some valuable domains that contain the adjectives above, though I never really search for such domains. My searches are all about the exact name. I wouldn’t consider all great domain names to be generic. Google suggestion keywords are important to me. IF I can type in the keywords into Google, and they pull up as a search suggestion, I know that people are typing in the keywords. Although, I would rather own a GEO job or hotel domains, I feel that using ‘Dynamic’ or ‘Best’ as adjectives to describe the keywords are like a chained chess that won’t unlock a potential sale. They are anchors that keep a boat from moving across the ocean. Too many adjectives weigh down a domain. However, if TopJobs.com was available, I believe that is a good domain name. I don’t care too much for acquiring reverse order domains. I never sold any. In addition, CoolDownloads.org failed to find a buyer. I try to find the domains I know a company will want. SeWatch.net is a great selling tool to reveal site tags. Exact match service domains are highly marketable such as ResumeServices.com, CoverLetterServices.com, CleaningServices.com, HandymanService.com, TreeService.com, LoanService.com and another other category that has many keyword results. Some may challenge me on suggesting that the adjectives listed above are good adjectives that add value to a domain name for SEO purposes, or as marketing tools. In my opinion, adding any of those adjectives to my past sales would have amounted to zero sales. SeWatch.net will help you to identify the tags a website uses. You have leverage presenting an exact match domains that are listed as tags than offering a domain name with too many adjectives. Don’t get me wrong, long tailed domains are valuable. LaserHairRemoval.com is a major 6-7 figure domain name. MesotheliomaTreatment.com and the .org have great value due to their high CPC (i.e. attorney, treatment, health care, insurance, etc), and relevant demand. I own the domain AlternativeMesotheliomaTreatment.org. The domain has a high CPC in the $22 range. Estibot only values the domain at $5, but this domain is much more valuable in a sense that it can be developed in a reliable information site. Imagine the value of the ad clicks for attorneys, health care, treatment, and so forth. Adding addition keywords to compliment the category is useful to narrowing down a topic. There are many resume websites that outperform resume.com and resumes.com. I’m sure the subdomain of a generic domain spend a lot of money on SEO services, print advertisements, affiliate programs, and by bidding on keywords. Your goal to sell a domain is to find a website or company that will want to use the domain to either build a website, point to an existing site, to build mini-sites, and essentially own the keyword category. Type-in any high traffic in SeWatch.net. They will likely provide you with the site tags. Ask the following questions. What type of services or products does the website provide their customers and clients? How important are the keywords to the company? Will a consumer identify the company’s products and service with the domain name? Will paying 5 figures to acquire HDMICables.com help a company that sells HDMI cables? Companies have the money to spend. You know that a domain name is good when you get an immediate reply asking for the price. On opposing side, a domain name that never receives any responses, or is one that you can’t seem to find a home other than in your possession may be worth analyzing to consider its marketing value. Why waste weeks, and even months trying to sell a decent domain name? Your time will be better spent promoting your best domains. Domain names with low average keyword results and barely any searches can be awesome. If the domain name is great, it really doesn’t matter what an appraisal system conveys to you. You can sell this domain to a company that provides the exact service or sells the exact product. SeWatch.net will guide you to the lighthouse tower with a potential buyer awaiting your domain. Your domain is like a ship sailing the sea. What will it take for you to reach your destination? You need tools to navigate a sale. Many domain commentors will oppose anyone that considers traffic, Google Page Rank, keyword performance, and any other stats as factors to determine a domain’s value. They will sway one away from the riches. The generic quality of a domain can represent a name with little searches and average keyword results. And this domain name can be the most marketable service as company has to offer their customers. Find what site tags a website uses to capture traffic. Know everything there is to know about the website and your domain. If they request traffic, and your domain doesn’t generic any traffic, tell them your site is only parked. Be transparent about the domain. Build value in the domain name and the keywords. Having high traffic will also attract major attention. Good domain names are those that describe a particular product, service, and anything else a company depends on to operate their business. When you visit Wal-mart and Target, you will notice they sell many products. What are the name of these products? Non stick cooking pans, stainless steel knives, leather backpacks, leather jackets, and many other products are descriptive, and valuable. They are usually made of a specific material, or have additional adjective to describe them. I would have to spend a fortune to market allboutnonstickcookingpans.com. I wouldn’t waste the time or the money to register the domain. Sewatch.net is a good domain tool to analyze SEO relevant information. Site tags are the key to unlock a sale. Good luck Thanks for reading. 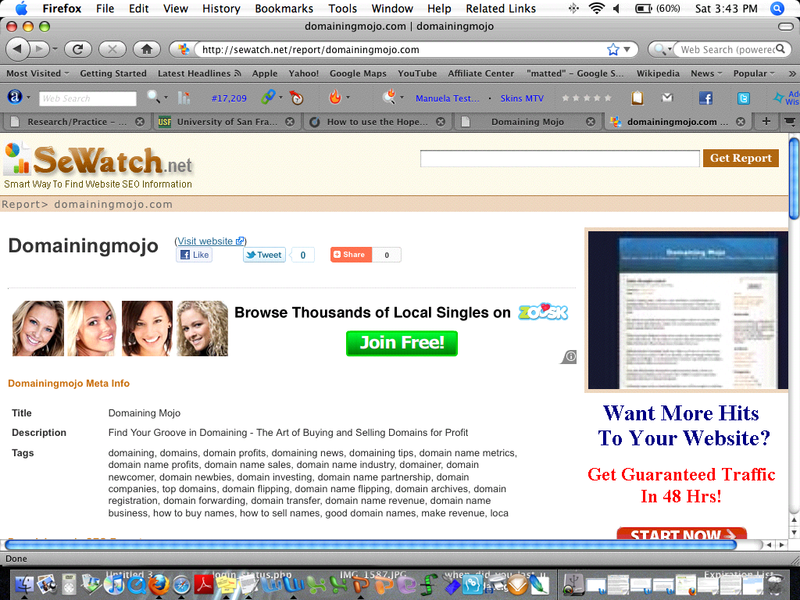 Below are the site tags I use for Domaining Mojo. DomainingMojo.com is pointed to DomainingMojo.wordpress.com. DomainingMojo.com is masked. I would prefer a site that specifically runs off the domain name itself, but I would be open to possibly expanding the blog to reach a larger audience. NetTube.org is scoring high traffic. The site was nonexistent, but then I received 675 unique visitors on Tuesday. Yesterday, the domain scored another 99 unique visitors. I always thought the domain had a cool name. I also acquired TaxTube.org and JasonsTube.com around the same time. NetTube.org will probably perform well. The site produced 13 ad clicks yeseterday, and was searched 637 times. My entire domain portfolio is not searched 637 times in 2-3 months. I recently wrote an article on how hard it is to find a domain to generate 1,000 unique visitors. In December, NetTube.org already generated over 800 unique visitors. All of a sudden, the domain is performing. The 13 ad clicks is an indicator the domain will continue to spark interest. I sense NetTube.org will continue to score traffic. You never know which domains will outperform the rest. It’s a matter of time that such domains can make an impact. NothingbutCoverletters.com demonstrates that there is relative demand for cover letters. It takes me 3 months and 790 domains to generate 30,000+ traffic. I can’t imagine how much revenue the website generates with their traffic leads. Another website that generates heavy traffic is careerfield.org. The website went from a hand registered domain this past Summer to generating over 200,000+ unique visitors per month. The traffic was instant right out of the gates, going from 10,000, 30,000, 90,000, 121,000, and now has gone over the 200,000+. Websites that focus on one niche have the ability to attract visitors. My Magic Writer blog proved that having too much information disrupts the overall quality. People don’t have the time to read several different tips. Hopefully I can develop at least one website that can generate 1,000 unique visitors per month. That would be a great accomplishment. Then, I can work on duplicating the same results on a handful of other domains. In order to be successful at developing websites, you have to know your target audience. Thanks.